It’s much more of an artistic endeavor than an engineering effort. As such, ISD projects efforts and results are NOT predictable in time/schedule, costs or quality. If a project went well, you probably just got lucky. And you probably should have been at the race track’s betting window that day too. Because remember – you were just lucky that day. But that is not good stewardship of shareholder equity. That’s no way to run a railroad or any other business. Whatever, whenever, however. It ought to be a crime. As the Maturity Model suggests – this is a very immature approach to ISD. Perhaps in your world this is appropriate. Perhaps not. Where are you? Is it here? Level 1? Or are you beyond that? Here someone somewhere is getting a handle on some of what is needed to run an ISD (or a Performance Improvement) shop – at the business unit level. Some processes may have been mapped formally and some people may actually be following the defined processes locally. Perhaps some are following some semblance of ADDIE plus other processes. That’s a start – but there is more to any business entity than its New Product Development process, which is all that ADDIE is. Is this where your organization is at currently? As obvious by the title this is where more and more ISD Processes are mapped, communicated, and perhaps followed/adhered to – as driven by the Enterprise. It can happen! I’ve seen it! Is this where you are at? The language of organized versus managed should be/could be telling. It’s the difference between having an organized view of your processes – and actually managing them using data. Do you know your own “development ratios” for your different types of deployment and complexity? Can you be predictive about costs, schedules and quality? Can you see where some efforts actually beat those standards – and where others do not? Is this where you are currently at? Here the data being collected continuously or statistically is being used to find areas in the processes for tightening up and/or loosening up – improving them. I am a fan of a Tom Peter’s phrase: loose-tight and tight-loose. That means/suggests that some processes should be tight. And others should be loose. And it sometimes means that that need is a situational variable. Be flexible when planning and conducting your ISD efforts. Is this where you are at? Continuously improving your ISD Processes using data versus opinions? If so – very cool! If you were the single shareholder of your Enterprise – you’d already know the answer. It would be your money that is being put to best use rather than wasted. So ask: what’s in it for me/ the learner/ the management/ the stakeholders? 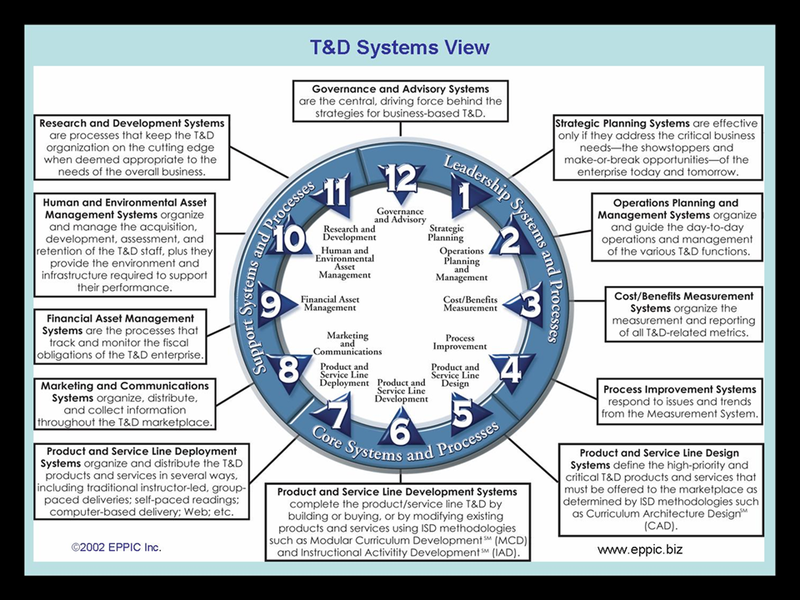 My model has the “system” for T&D or L&D or Knowledge Management – has 12 sub-systems – that number is of course somewhat arbitrary – acknowledging that the number could have been 10 or 13, etc. Here is an overview of the 12. At the Business Unit/Department level – all of the processes BTW – beyond those that some might think of ISD in the strictest sense – those 12 sub-systems operate from formally to informally. The goal is not to formalize everything. The goal is to formalize everything that is an issue (problem or opportunity) with an ROI worthy of the effort. Some problems or opportunites are so small in value that it’s better to ignore and live with them than to fix everything – except when you’ve got unlimited time, money, etc. Addressing EVERYTHING just because you could is not logical – unless – you have those limited resources and don’t need to concern yourself with ROI as a screening mechanism. And by ROI – I mean the predicted ROI – used to compare that opportunity to invest shareholder equity into something – compared to other opportunities. From this 2001 book – which is available as a free PDF – here. T&D Systems View is also available as a $15 Paperback book – and $7.50 as a Kindle – for more and to order – please go – here. Note: I am currently running a monthly Blog series on the 12 sub-systems of a T&D System. See the series opener – here – on 12 O’Clock High – Governance & Advisory systems/processes – which is the most important sub-system IMO – because from there – everything should flow in terms of directions and resources – and ultimate accountability – for what should be a collaborative effort – in addressing the business/ enterprise needs for Learning & Development. That’s where/how you “get aligned” to their needs. At 12 O’Clock. Marketing your Learning Content would go better if seen as result of a collaborative response to both target audience & management demand. Doesn’t matter how good your L&D content is if you are not perceived to be in total alignment with the business.